Objective: To report the methodology and summary data of the Health Outcomes and Lifestyle In a Sample of people with Multiple sclerosis (HOLISM) longitudinal and validation cohorts. 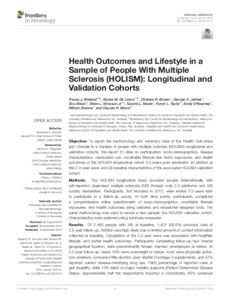 We report (1) data on participation, socio-demographics, disease characteristics, medication use, modifiable lifestyle risk factor exposures, and health outcomes of the HOLISM longitudinal cohort 2.5-years post enrolment; (2) attrition at this 2.5-year wave; and (3) baseline characteristics of the associated HOLISM validation cohort. Methods: The HOLISM longitudinal study recruited people internationally with self-reported diagnosed multiple sclerosis (MS) through web 2.0 platforms and MS society newsletters. Participants, first recruited in 2012, were invited 2.5-years later to participate in a follow-up survey. At both time points, participants completed a comprehensive online questionnaire of socio-demographics, modifiable lifestyle exposures, and health outcomes using validated and researcher-designed tools. The same methodology was used to recruit a new sample: the HOLISM validation cohort. Characteristics were explored using summary measures. Results: Of 2,466 people with MS at baseline, 1,401 (56.8%) provided data at 2.5-year follow-up. Attrition was high, likely due to limited amount of contact information collected at baseline. Completion of the 2.5-year wave was associated with healthier lifestyle, and better health outcomes. Participants completing follow-up had diverse geographical location, were predominantly female, married, unemployed or retired. At 2.5-year follow-up, nearly 40% were overweight or obese, most were physically active, non-smokers, consumed little alcohol, used vitamin D/omega-3 supplements, and 42% reported current disease-modifying drug use. Thirty percentage of reported cane or gait disability, while 13% relied on major mobility supports (Patient Determined Disease Steps). Approximately half the respondents reported a comorbidity, 63% screened positive for clinically significant fatigue (Fatigue Severity Scale), and 22% screened positive for depression (Patient Health Questionnaire-9). The validation cohort's characteristics were mostly consistent with previously reported HOLISM baseline data. Conclusions: Exploring prospective associations of modifiable environmental/behavioral risk factors with health outcomes in this international longitudinal sample of people with MS will be beneficial to MS research. Impacts of attrition and selection bias will require consideration. The validation cohort provides opportunity for replication of previous findings, and also for temporal validation of predictive models derived from the HOLISM cohort.